Editor’s note as of 20:00 CET 1 April: This post is no longer being updated. Read our summary blog post “Monitoring (almost) complete” now live in our blog homepage. Latest reentry forecast provided by ESA’s Space Debris Office, ESOC, Darmstadt, Germany. With the latest available orbital data and space weather forecasts, the re-entry prediction window stabilised and shrunk further to a time frame running from the night of 1 April to the early morning of 2 April (in UTC time). Reentry will take place anywhere between 43ºN and 43ºS (see map here). Areas above or below these latitudes can be excluded. At no time will a precise time/location prediction from ESA be possible. This forecast was updated approximately weekly through to mid-March, and is now being updated every day. Need more information on space debris? Surely in this day and age of UAV`s, it must be possible to launch a few small UAV`s remotely operated, to steer the possible rogue satellite, or space station to a safer trajectory, or even have them operated not only from Earth base stations but from the ISS if need be? The “A” in UAV stands for “aerial”, but this space station is still far above the atmosphere. A remotely operated spacecraft would cost hundreds of millions of dollars to build and launch, and there is no real reason to spend the money when the risk of harm from this station re-entering are bordering on infinitesimal. Also, operating such a craft from the ISS would be pointless, as the ISS is in a different enough orbit that it would rarely be within range of Tiangong-1, and if it were, it would only stay in range for a few minutes at best. ” At no time will a precise time/location prediction from ESA be possible”. Given the first statement by the ESA and given the projected band of re-entry possibility, the second statement is an empty pronouncement. The risk is tiny given the vast majority of the surface of the earth that is covered by oceans or unihabited. The surface of the earth is approximately 500,000,000 km^2, but, if you generously assume each person takes up 1 m^2, humans in total only take up 7,000 km^2. The odds of a person getting hit is less than 1 in 70,000. Powerball is 1 in about 292,000,000. But I heard a piece of the Chinese space station hitting someone is more like 1 in a trillion. Perhaps the trillion number comes from the odds that *you* will be hit. Which might be something like the probability that *someone* gets hit times the probability that it is the actual reader. That would be on the order of a couple hundred trillion to one if we go by the 70,000:1 above. Of course there should be some correction to that for the fact that more than one person could be hit or that the possible impact zone is smaller than the entire earth’s surface, etc. But the odds that the person reading the article gets hit are probably in the trillions to one. The odds of you personally being killed in a car accident today are very small, but it is a certainty that someone will be killed in a car accident today. Odds of 70,000 to 1 that someone will be injured (not even fatally) is much better odds than certainty of death. Perhaps we should spend millions of tax payer dollars improving car safety? If there was only one piece of debris, that might be true. You first have to divide the odds by the number of chunks that make it back. If a piece of debris has a surface area of 2 square meters, then the odds for that chunk double. Then you factor in the area of influence for any impact. If a piece of debris misses a person by 1 meter, they may still be burned, exposed to impact shrapnel, be exposed to toxic noxious substances, the car they are in could wreck or explode, perhaps affecting others, and so on. My point being, if Ian Malcolm approached this issue he would quickly shift to a model of historical data, which is where these 1 in a billion estimates are coming from. It is entirely possible to that both of these things are entirely accurate. It is impossible to predict who will win the lottery. Yet your chances of winning the lottery are bordering on the infinitesimal. Every human being on the planet could fit into Manhattan. The Earth is very big, and the space station is only going to hit one (or a few) spots. If you want to meaningfully reduce your chances of dying tomorrow, don’t get in a car. Spell Check got me again. Square miles. Oops. OMG the people working and living in Manhattan wouldn’t like that!.. Can you imagine the traffic jam then? Most of the surface area where the station can fall is entirely uninhabited. If you have a computer, and a pen and paper nearby, and also too much time on your hands, you can check for yourself what the actual probability of the satellite and its debris hitting a human is. You ought to start by first calculating the summary land surface of the band, then calculating the surface of every single inhabited area and also the average population density per meter square. You might want to start by e-mailing the Chinese and asking them for the surface of the satelite and its components and (bordering on infinity) divisible parts, then ought to consider all the possible angles of rotations of said parts (which affect the surface they fall over) and determine the average combined surface and. If you use merely common sense, however, and aren’t pretending to be smarter than people earning a lot of money while being paid to be smart, the possibility of it hitting any inhabited area is low on itself (look on a night time image of the Earth), then depending on the population density of inhabited areas there is also a somewhat slim average chance that it will hit anyone. You’re most probably more likely to be ran over by an actual city bus made in China the size of the station, or that you’ll die ten years from now as a consequence of UV damage caused to your cells this very day. Do you think that your chances of being ran over by a Chinese bus or dying from cancer in 10 years from today’s sunlight exposure is worthwhile a consideration beyond “borders infinitesimal”?. “Infinitesimal” means “very, very small”. They don’t know where the spacecraft will land, but the things we care about it hitting are scattered about a very, very large area. It might hit my house, and that would be bad, but it almost certainly will not. So no, there’s not inconsistency between the two statements. It would make more sense to hit it with a missile that would cause it to crash into the ocean. UAVs cannot operate in or get to space on their own. You are thinking of a space tug, that doesn’t exist. Mike, the problem with shooting down objects in low Earth orbit is the excessively large debris field that it can create. Smaller fragments will stay in orbit much longer than large pieces will, and creates space junk debris clouds that will spread over time and endanger other space vehicles/space launches. Google “Kessler Syndrome” as to why doing something that creates space junk in Earth orbit is an exceedingly bad idea. Actually, small pieces’ orbits decay more quickly than large pieces, because their surface area is large compared to their mass, which causes them to lose height more quickly. How would hitting the space station with a missile cause it to crash into the ocean? It is already likely to crash into one of the oceans since the earth’s surface is mostly ocean. What hitting it with a missile would do is create a rapidly expanding debris field with the mass of the missile included in the debris. Each of the pieces of debris would have it’s own speed and trajectory and orbit. Some of the pieces would return to earth, but many more would not because their velocity would be increased by the violence of the explosion. The last thing we need is an expanding cloud of space debris orbiting the earth and threatening satellites and the ISS. A missile has been used to take out a satellite. It’s possible but not cheap, and it doesn’t cause the target to crash. It causes bits of the target to fly off in all directions and speeds, meaning some comes down sooner and some will be up there for quite a long time – a constant hazard to anything else in earth orbit. Tell that to the USAF. XB37 might come in handy here. Not an expert, but how FAST is it traveling??? You are 100%, no margin of error needed. The falling space station is traveling at 17,000 miles per hour. That makes it difficult t catch up to. 8 tons hurtling at speeds we can’t comprehend? I don’t think so. It’d be like trying to nudge a runway 18 wheeler careening down a mountain road with a remote controlled toy car. Oh no honey. A UAV can’t fly up where there ain’t no air, and even it it could it can’t reach the speed of the space station, which is around 7 km/s. That’s stupid fast. As far as aerospace tech goes, we really aren’t much more capable than we were in the sixties. Our computers are better, though. If we could fly a drone up there, what would we need space stations and rockets for? Should Tiangong1 go down in the middleEast there is a live video stream on twitch from newZstream. The speed differential between a UAV and an uncontrolled re-entry vehicle is immense – absolutely impossible with current technology. I agree. If not a UAV, some sort of intercepting device should be launched as a test case. Call it a test run for missle defense. Here’s a crazy idea, how about we make it mandatory to launch a satellite or space station with some sort of last resort self-destruct measures so that it will be much smaller on reentry. By the authority of the national government to which the agency belongs, or whose country the space agency is licensed and located in. I would think he means under UN treaty, but isn’t this vehicle out of control, meaning that any controlled de-orbit wouldn’t be possible if it was on board. The plan was to command the station to deorbit into a known harmless reentry after its end-of-life. That went away when they lost communication with the station. A self-destruct mechanism would have had the same defect. If they can’t call it to tell it to deorbit, they can’t call it to tell itself to blow itself up, either. And having a self-destruct mechanism adds a host of safety issues. Such a mechanism would be more likely to accidentally kill a crew than an uncontrolled deorbit would be to harm someone on the ground. It’s going to break up on re-entry anyway. Putting a bomb on it wouldn’t help. The whole reason for this situation is that China is no longer able to contact the station, so they can’t use its thrusters to direct it to the middle of the ocean, which was the original plan. No, you don’t want a bomb aboard stuff in space. The odds of it going off by accident (or by malicious hacking) are too significant. That’s horrific for a manned station, but even for a satellite it makes for a cloud of debris in unpredictable orbits, a hazard to anything else up there for years to come. If you need to get rid of something in space, your two good options are to make it so it burns up as it falls, or boost it out of earth orbit. The latter takes a lot of fuel and hence is expensive. Making or letting stuff fall is quite easy and cheap and very low risk , so that’s what happens. Yay, instead of one big thing that will fall on the earth and mostly burn up, now you got a million small pieces which will stay in orbit forever, causing a lot more trouble in the future. … not to mention you also put an actual bomb on every spacecraft, with a system that could go wrong (=> explosive) for any number of reasons. Two reasons, first as previously discussed, debris. Second, there are already enough factors involved that can cause a catastrophic failure to a mission, why add explosives or intentional failure points to the mix. Here’s an even crazier idea: how about we not assume an event is any riskier than it really is, and just leave it at that? Discussing and refining the risk of an event like this one is a good thing. But some of these comments are proposing solutions out looking for a problem where there isn’t one. The self destruct features would only be internally installed to the hardware of the station/satellites (free from hacking) and only activated once the connection to its control center is lost. Astronauts are pilots to an extent so they will understand that a space station may have explosive material aboard. And if countries were so concerned about space debris they wouldn’t be sending up hundreds of satellites every year. A mandatory space debris bomb? Anyone who works in the space industry would balk at that idea. The likelihood of this space station harming anything is absurdly low. You’re way more likely to be hit by a car tonight, and hundreds of people will be as this station is going down. But nobody is worrying about that, because it’s not as spectacular as a fiery school bus from space. Blowing it up would just send lots of tiny chunks into a higher orbits where they would mess up other spacecraft. Then those would blow up and send out more chunks. And generally nobody has a good time. In short, don’t put bombs in LEO. You’re right, it is a crazy idea. Great idea. How about a way to break it into smaller pieces during deorbit, as heating becomes significant. Perhaps the modules can be designed to separate, by mechanical means–connectors that are weakened in anticipation of deorbit? I was telling my family about this and instead of a response of “wow” or “that’s interesting “. All I I got is “did you notice the date? APRIL 1, you’ve been got”. Oh well at least I still believe . How about the e-sail, electric solar windsail. One of the uses of the spacecraft could be collecting asteroids and other space debris like satellites(?) But space stations probably too big/heavy.. waddayasay Pekka Janhunen? Get Dr Who to lassoo it to the Tardis, and drag it to safety! With re-entry, is there danger ? It’s not a large scale hazard, but I wouldn’t go exploring the crash site, or hang out down wind of it. How about designing a drone space craft that can attach itself to out of control satellites to steer them into safe orbit and then detach before impact into a pre determined location ? It could certainly be done. It would be very VERY expensive, but it could be done. You’d need quite a large and sophisticated spacecraft, to rendezvous, grapple, and tug the target object. The big problem would be that changing your orbital plane takes a huge amount of fuel in low Earth orbit. It’s really not practical at all, so the spacecraft would need to be launched into the same orbital plane. Effectively it would be a single use device. Even if it could boost back up into a stable orbit, there would probably never again be something in its orbital plane for it to push, and the next time you needed such a thing, it would be in the wrong orbit and thus useless. I was just looking up at the bright blue sky and saw, what I thought, was a meteor. I posted my observation on Facebook and a few folks told me about this space station re-entry. I haven’t been following it, but, if it helps, I saw it at about 11:25 am (ET) and I’m in the Western Catskill Mountains of NY. I live at 40N/105W [Boulder, Co]. Is there a site where I can find real time tracking info? If I knew what times Tiangong crossed my longitude I would only go outside every 90min to pray not to be hit. Also, does anyone know if it enters the atmosphere in your area will there be a sonic boom? heavens-above.com has visibility predictions for Tiangong-1. Just enter your latitude and longitude. According to the latest forecasts, it is unlikely to come down over the US. See, for instance, http://www.aerospace.org/cords/reentry-predictions/tiangong-1-reentry/. Click on the world map showing the ground track for an expanded view. heavens-above.com is an excellent site. Heavens-above has a “Live Ground Track of Tiangong-1” on its main page. 🙂 In case you don’t frequent the site, for predicted passes, select “Tiangong 1” slightly lower on the main page menu; select “All”, and it will list visible and non-visible passes for your area. Will it be safe for airplanes to be in the air while the space station is falling to earth? My flight is on 4/1 from Europe within the latitude stated. Things are falling to Earth all the time. This bit just happens to be man-made. Mostly it’s just rocks. None of it ever hits aircraft, or anything really. You’d be amazed how much of our planet is just empty fields and ocean. Don’t worry, the likelihood of your plane getting hit by Tiangong is going to be lower than a live rhino somehow getting smuggled aboard the plane, running amok, and taking it down. Neither situation is gonna happen. SATFLARE is an amazing site. There were sonic boom sounds when Columbia broke up over East Texas that were heard as far North as the Dallas area. What is the URL to check for NOTAM and NAVTEX of the South Pacific area, especially for Point Nemo where it is supposed to reenter? Where it WAS supposed to re-enter. Now it may re-enter any point intercepting his orbital plane, with the same probability. 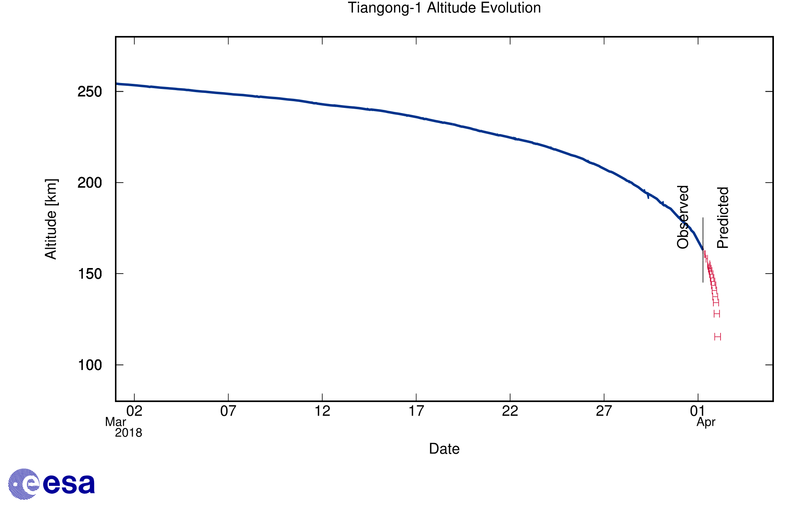 Taking a look at perigee and apogee graphs it seems like Tiangong-1 is surfing on our atmosphere, bouncing up. I posted my question about the altitude gain before I saw your comment… I have to imagine this “surfing” will continue to delay the inevitable.. can you estimate by how much? I am in Scotland. Unlikely to see this re-entry, but for those in Britain with clear skies, the ISS passes twice tonight during darkness. It’s a cert; always appears bang on time and easy to see. Google spotthestation for observation details. No April fool, and you don’t need binoculars. Mark, the inclination is smaller 42.7 against 51.6. I do not believe anybody in UK may (luckily) see anything. I’m confused by the latest advisory. It says “midnight April 1 to early morning April 2” ….that’s over 24 hours. Yet the graphic shows a much smaller window centered on April 2nd. Midnight April 1 utc was 12 hours ago as I write this…. or does esa mean some other start to the window? Guess I read it too quickly..”night of April 1″…So the window opens in a few hours I take it. need to put a remote controlled space tug in orbit. it. used to salvage, repair, and rescue. I have been watching the satellite tracker and Tiangong-1 has GAINED over 2 km in altitude over the past couple of minutes.. why is that? It passes the equator every 44 minutes I have seen it as low as 140 KM in alt. It is in a circular orbit. in fact, an elliptical orbit that grazes the atmosphere will become more and more circular until it finally decays. Each side of the orbit has a difference of about ten kilometers. The higher side is called apogee, the lower side is perigee. It’s kind of like being on a swing set. Every time it passes perigee is like passing the bottom of your swing. Its momentum swings it back up again, then it falls, then it swings up… But without a push of some kind, it swings lower each time. Eventually it’s going to stop passing perigee and get caught in the atmosphere. The earth is not a perfect sphere; it bulges out at the equator where the surface is 21.3 km farther from the center of the earth than at the poles. That’s actually quite a lot given that the peak of Mt Everest is only 8.848 km above sea level. So even if the satellite were in a perfectly circular orbit (and it’s close) it will be closest to the surface when it’s over the equator. Seems to be related to the azimuth. The elevation is now on the decline as the orbit gets closer to the equator. https://www.idokep.hu/webkamera/cirrushungary2 Look at half past eight.P.M. As per Aerospace Corporation, Tiangong-1 is currently predicted to reenter the Earth’s atmosphere around April 2nd, 2018 00:30 UTC ± 1.7 hours. Looks like Venus to me?! if this thing lands in my back yard i’m keeping it! 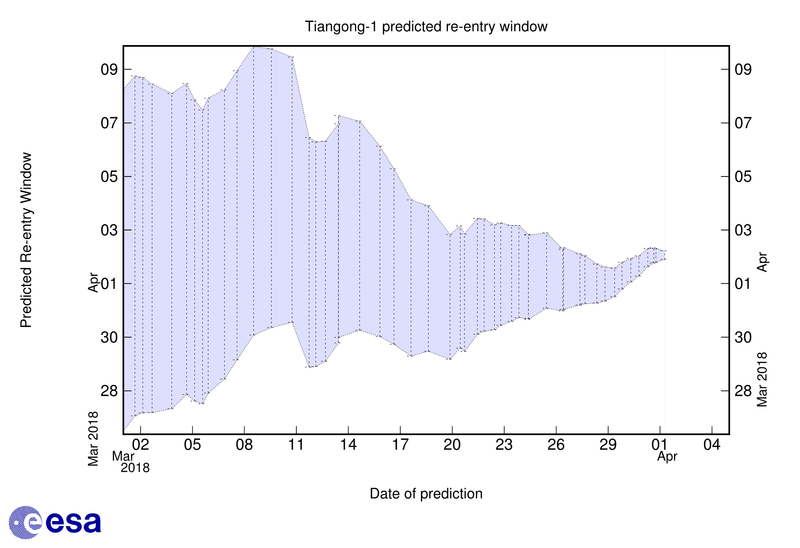 At 6:20 am, Apr.2,2018, Tiangong-1 stayed at an average altitude of about132.75 km .The estimated reentry time is at 8:42 am (the earliest time is at 8:24 am and the latest time is at 9:01 am ), 2 April, Beijing time. The reentry center is located at 40.4°W and 27.4°S. So … Guys whats the update of Tiangong? Can anyone lead me to Live tracking application? When it reach to atmosphare area.. Most of the body would burn and Due to excessive degradation, it will turn into ashes ..
Congrats . I JUST catched that Flying bird..
HI, I live inn the West Midlands UK and at precisely 6 am(our version of world time), I was half asleep looking at an old oil-painting on the wall on my right from the south facing window with two drawn curtains on. A brilliant pulsating orange filled circle bigger than twice the size of a large military medal appeared directly in front of my view of the oil painting for about 25% of a second going grey + then vanishing, instantly another similar shaped orange image appeared again 25% of a second before greying and vanishing. Needless to say I was now fully awake and putting the image down to a possible ‘deaf of a relative’ warning. Then I found I could explain it…………..
1/ The Inferno of the inside of a burning metal space station entering the atmosphere would of caused the colouration. 2/ The Brightness of the burning metal would be somewhat lessoned by my curtains which I am very thankful for. 3/ The appearance of two orange area images (not at the same time)would of been caused by the turning of a steel tube from one face to another(slowly turning). 4/ Back to the two curtains. This is not the normal configuration but due to unseasonably cold temperature’s caused by the night being completely void of clouds. This caused the sunrise to be a unusual light blue colour and free from any polluting lights clouds. I estimate I could of seen two miles up. Was this the flight path? The date of my observations were 01.04.2018. 5/ Using my theory on how this ‘tube’ was spinning (laterally) , she was heading West towards the pacific. I am Mauro from Bariloche, Argentina. On 1st of April with a group of friends were on the top on a Mountain “Cerro Colorado” near to Villa La Angostura. Around 9.15pm (of Argentina) in direction of North we watched very long trail of something entering to the atmosphere crossing approx 90° of sky. In this moment I remembered the news about TIANGONG-1 and we wonder if there is some possibility that this object was the TIANGONG-1. Looking for references I found out that the time of the falling (5.16pm PST) is right and and it was approx the same moment that the TIANGONG-1 entered to the atmosphere. Could be the TIANGONG-1 or it was just pure casuallity to watched a meteorite at the same time? USSTRATCOM reports the re entry location at -13.6 lat, 164.3 long. However Aerospace Corp now reports re entry at 24.5 deg S lat, 151.1 deg W. Does anyone understand why the rather large difference in these two ” official” re entry locations? HI. John with some more thoughts on my freaky observation just after SunRise in the UK WM. 6 oclock Aug 1st. Firstly, I am not a scientist and this image on my oil painting is of the blazing contents of China space station. I am intrigued that that the think again judging by the blazing orange image was turning end to end hence the two images appearing in quick succession . Again using my experience from April 1st at 6am…Me thinks it was turning clockwise. Now for arguments sake, water goes down a plug hole in a different direction as to how near the north pole…..does space debris always rotate clockwise? One thing that has not been touched on is the amount of radiation re entry causes. Hopefully my half a second exposure will be fine. The proximity of the rising sun to the doomed space ship may well of been a factor in the weird images in my bedroom . To have such a good view of the burning gasses with in this tube, some deflection of light must of happened probably caused by a thick outer layer of the atmosphere. I think I witnessed the Sun Shining throught the tube which formed a natural lazer, hence the imahes in my room. Again , I am not a Scientist, so you are probably having a good laugh at my observations. I guess I am very lucky in deed and just to add, logically speaking.. I think it lost those wings even before it went into re entry. Well that’s about it. I hope in future, we are kept more informed about the dangers of whats happened as this was a very large metal tube and glad it found water.